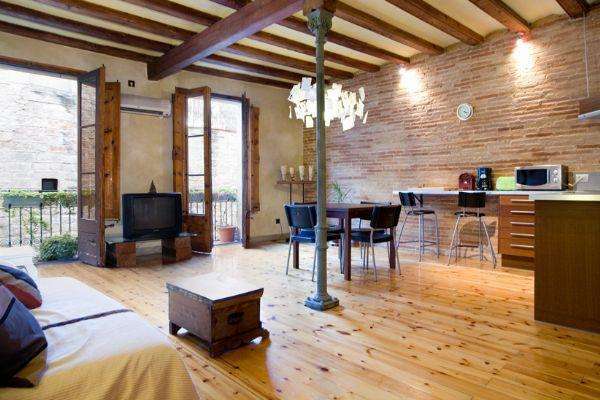 This exquisite one-bedroom apartment in El Barrio Gótic is ideally stuated in this historical district, where you will find yourself surrounded by the rich nature of the Catalan capital, while being able to reach the center of Barcelona in just minutes on foot. This apartment can accommodate up to four people. What sets this space apart from the rest is the traditional design of the apartment. Exposed ceiling beams, parquet flooring, brick walls and wooden doors that open up onto a balcony all add to the classic ambience of this locale. The living room is well-lit and furnished with a comfortable double sofa bed and a TV, perfect for relaxing after a long day. The modern kitchen is well equipped with plenty of the utensils and appliances needed to make your very own home-cooked meal, or try your hand at some Mediterranean inspired dishes! The bedroom has a comfortable double bed, and ample storage space for your belongings. The apartment enjoys a traditional design with a classic bathtub. This charming apartment, complete with central heating, heaters and air-conditioning is an ideal living space at any time of year.